1 Monkey/CHUEN begins a new Season of Light. As the 3rd season of the Tzolk’in, it represents the season of reproduction, the planting of the Seed that will bear the Fruit of the Tzolk’in’s Harvest. The K’iche Maya recognize this as the first day of a 20-day cycle of Creation. The first 13 days (the Monkey trecena) represents the Dawning of the Power to Create, and the 7 days that follow in the trecena of Seed/KAN, represent the manifestation of Creation, celebrated on 8 Monkey/CHUEN as the New Year (8 B’atz), Monkey/CHUEN in its zenith of Light and Consciousness. Monkey/CHUEN is a symbol of Human holding the Power of Creation. Flint/ETZNAB perfected the Dream of the Seed through a Higher Consciousness of Truth. Now the Meaning and Purpose of the Seed are identified as holding the Purpose to Create. The Dawn of Creation is the Beginning of Time. Monkey/CHUEN is the Weaver of Time, weaving the threads of our experience into the Tapestry of our Life. Monkey/CHUEN begins a new Life Story, living as a Divine Creator. An Ascension on 13 Night/AKBAL promises the Power of Believing we can make our Dreams come true. 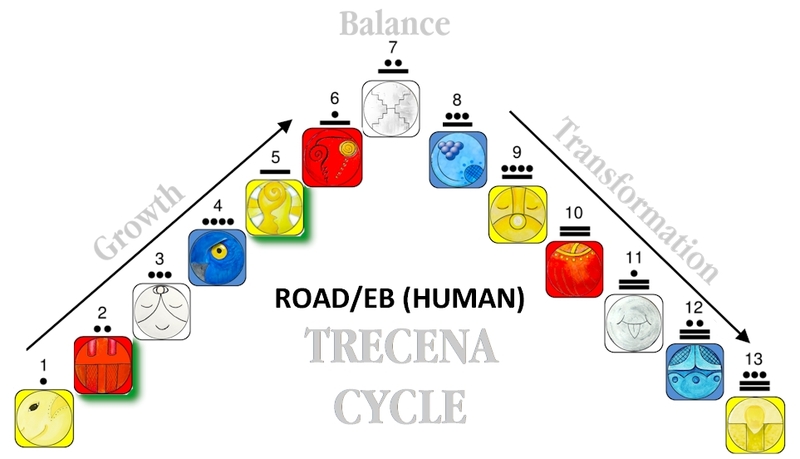 The Flint/ETZNAB trecena introduced us into the Core Days, offering a clearing of Karma that Balanced the Above and the Below, purifying our Spirit through an Ascension of Unconditional Love, 13 Dog/OC. Flint insured that we would Know Love as the reason for Creation and the Power to Manifest our Dreams. The zenith of our Transformation begins in the 8th uinal, a cycle of “pure spirit” and the Justice of manifesting our Creation by Divine Intervention. These are the most favorable days for influence, accomplishment, and Spiritual Consciousness. The higher numbered Tones are compared to a wave crashing – a powerful energy set on course to its destination. 6 Wisdom/CIB – we are drawn into the Flow of Creation and connected to the Wisdom of the Ancestors. 7 Earth/CABAN – balanced in the Above and Below by the Forces of Nature and the Movement of Mother Earth. 8 Flint/ETZNAB – our Power is exalted by a Consciousness of Truth and an Intention of Divine Justice. 9 Storm/CAUAC – our Transformation as Divine Creators is completed with the Creator’s Spark and the Revelation of our Unbridled Freedom to Create. CORE DAYS/ZERO POINT: The 7th uinal are the Core Days of the Tzolk’in as observed by Yucatec tradition. Dog/OC and Monkey/CHUEN reside at the Center of Creation. 13 Dog/OC completed the design that identifies us as Divine Agents of the Creator’s Unconditional Love. CHUEN identifies us as Divine Creators, given the Power to create the Beauty of our Experience. CHUEN can help us crystallize our Dreams. Monkey/CHUEN resides in the West, the direction of our Unknown Experience. CHUEN will help us Create a world of experience through all the perspectives of a Divine Creator, the Omega, the All-in-One. CHUEN will help inspire a Dream of the world as it will be seen by the new Seed of our Self. As the Weaver of Time, CHUEN will weave together the Time and Place of Human Consciousness, from the beginning to the end. Monkey is an Alchemist who takes the raw materials of Creation and spins them into Gold. A world without will be created from a world within. We exist in the Void of Creation waiting to Be. We claimed a new Divine Identity. Now we imagine the world it would Create to live in. Monkey will inspire the Dawning of a New Creation, a new Beginning of Time, the dream of a new Universe, a new Vibration, and a New Song of Love. In July 2018, astronomers discovered a distant object they believe will help to explain the beginnings of the Universe. At the center of a galaxy far far away is a massive black hole that absorbed all Light. It erupts, like a Breath of Creation, spewing a jet of plasma that will reveal a Universe of stars and galaxies. Science has begun to question the Universe as a “field of consciousness.” Science is discovering a balance that exists in the Above and Below. Scientists are beginning to speculate that Human may be just like the rest of the universe in substance and spirit. Carl Sagan was among the first to share beyond the community of science that “we are made of star stuff.” The atoms of our bodies were literally forged in the nuclear furnaces of other stars. We began in a realm of darkness, absorbing Light. Then by a yet Unknown catalyst of energy, a dark hole spewed all its Light into the Universe. We were ignited by a Divine Spark. Our Love will be Spoken into Creation as the Light and Matter of our Universe. The Haab calendar defines the influence of planetary experience and Intention that define the world of our experience. The current Year Bearer is 6 Deer/MANIK, guiding an Intention to serve as a Hand of God. 6 MANIK resides in the Galactic Week of 1 Wind/IK, the Breath of Life and Spirit. The world around us is calling to be recreated, just as we have recreated our own image of our Self. The Creation of a new world is the Intention of this Year, magnifying the Dawning of a new Creation on a planetary scale. Today we are inspired by Monkey to imagine all that it could be. Like the Seed, before the world is created, we will manifest the Dream of all that our world could be. Again, we’ll begin in the Creative Void. We will be the Circle within a Circle of the world we create around us. Monkey/CHUEN will inspire the Creation. The first thing that Monkey brings to mind is to not take ourselves so seriously. Anytime Human is given a major new task, we can feel lost without the details of how it will all come together. We start out in the realm of the Unknown. From a Higher Consciousness, we can stand on the Truth of Unconditional Love, to Believe in a Power Above to create a world Below, as beautiful as we Imagine. We only have to go with the flow of Divine Will, and Believe that a Divine Creator shared with us its own talent of Creation to manifest the world of our dreams. The Monkey/CHUEN trecena will generate the Passion to ignite a new dream, preparing us to spew our own Light and Breath of Creation. Monkey holds the Consciousness of Curiosity. CHUEN is a Divine Observer who looks at things up close and inspects the finer details. Monkey creates through play, imagining how things fit together to serve a meaning and purpose. CHUEN is the Master Artist, yet is said to never finish. It moves from one thing of Beauty to another. It creates a beginning that will be completed by the Divine Intentions of the Human that will live in the Below. Living Life as a Creator, our world will be completed as we go. We are offered the Consciousness of our Purpose to Create it. The fabric of our Lives will become an Expression of a Dream of Unlimited Opportunity. Monkey will remind us of the Chaos of Creation as it was at the Beginning of Time, holding all possibility. I am seeing it in my own life. Shortly after the Finch took flight on 5 Wind/IK, we were notified that bird feeders would no longer be allowed on our balconies. It’s taken a few days to process. I was set to the task of removing all the Seeds and dismantling the habitat that was home to all my bird friends. It was a dark day indeed. The little Chickadees and Finches stop by and look around, but the world they knew is gone. I cry for the way things were, though my balcony has become a new blank slate of possibility. I begin in darkness of the Unknown, waiting to Know the new Love that can be Expressed outside my window that now looks so empty. I’m believing in the Beauty that’s still there, beyond my balcony. There is a synchronicity in my experience. Before the balcony garden, there was a 150 foot tall pine tree that nearly wrapped its arms around my balcony. It held me for several years. Then one morning with the shriek of a chain saw I watched a climber lob it off from top to bottom one foot at a time. It was just as painful. The tree and I were crying together. All that was left for me to keep as a memory was a handful of the sawdust I still hold dear. The change opened a new view of the world, and the balcony garden was born. I still miss that tree, though see that God brought new Love on tiny wings that lifted me to a Higher Consciousness of the Love of Mother Earth. The Creator always brings something Higher than we’ve known before. We Honor “what was” for the Love that we will never forget as we dream something new for the Whole. Residing in the West, CHUEN can touch our emotions. To create our new world we must open ourselves to new possibilities. I can stand believing that the garden can be recreated in a way more beautiful than before. It requires a huge Leap of Faith. The Elders say that to be a Divine Creator we must live as the Hollow Bone. For the Creator to work its magic of creation through us, we must be clear of all our Human expectations. We are creating something we’ve never known before. We can dream of the Love we would experience there, and the Creator will help us manifest the form that returns the Experience of Love we dream of. We volunteered to be a living sacrifice, surrendering our Will to the Divine Will of the Creator. To wholly give our self, requires that we let everything go. Something must die for something new be born. The old world must die for a new world to be born. The Elders on the Native American path offered Sweetgrass as a Blessing of Love. The tradition of smudging first uses sage to purify and clear our Spirit. Sweetgrass was the important follow-up, bringing Love back in to fill the empty spaces. We are filling empty spaces of our past that Flint swept away. This is an important time to fill our Hearts, Minds and Bodies with Love. We can call on Light to fill us up with the Creator’s Love, so that the Breath of our Life and Spirit will speak a Creation born of Love. We’re called on to apply all our Consciousness and the Wisdom that will be shared by 20 Divine Perspectives to manifest a Creation of Love, from a new Beginning to its End. Monkey will help us to see what a wonderful opportunity it is, and nothing to be afraid of. After all, if a genie gave us a magic lamp, would we spend our time missing the way things were? Or, dreaming of everything that could be? Silly Human. My balcony seems empty of potential. I have no idea what could take the place of what it was before. I wonder if something hasn’t been cleared from your life that was central to your experience of living. We can draw a new circle around our own circle, and remember the Blessing of building a new world from scratch. We volunteered to believe that the Creator would share the Divine Way and gave us the Power of Unconditional Love. Monkey can help us see the Beauty in a blank page. We’re starting a new climb – a very important climb. Our Ascension on Tone 13 was the “crashing of a wave” of energy. Tone 1 can feel like a crash landing as we will begin again from a state of inertia and build again the momentum of the next wave of Transformation. Go with the flow and don’t take your initial perceptions of chaos too seriously. Be totally open to inspiration. Tone 1 is never a good day to accomplish big things. It’s Intention is to Dream big things. If you can, use this time in your everyday life for clearing things out, reorganizing your desk, or other tasks that don’t require your best thinking, doing, or communicating. Be satisfied if you can accomplish the task of sorting the paperclips into piles of the big ones and little ones. This is not a day to place expectations on yourself. Know that by Tone 3 you’ll be inspired to move in a new direction. Let your Heart be Light in a new Leap of Faith. To all my relations, may we let go of a life we knew to create a world that will manifest a Higher Experience of Unconditional Love. May we be the Hollow Bone, free of all Human expectations, to receive a Dream that will be Spoken through us by the Creator. The Creator Knows who we are and everything we need to live our lives in a good way. May we be the Observer like Monkey, who Dreams, then watches the Creator stitch together the substance that will return the Experience of Love we Intend our lives to be. May we believe in the new Seed of our Self that holds a Higher Consciousness of Love to imagine something more beautiful than we’ve ever known before. A VISION FOR THE NEXT 20 DAYS: 8 B’atz (8 Monkey/CHUEN) is the K’iche New Year that celebrates the creation of a new reality. 8 CHUEN is observed as the Initiation Day for the new Daykeepers. CHUEN is our time to experience the Power of the Omega, the all-in-one. We might imagine how each of the 20 day signs will guide us on the journey home to a new beginning. Imagine we were sent out into the world on a Quest to Know Love, and now we are returning Home to the Center. Imagine each Day Sign falling into step for the final leg of the journey that will end at a new beginning. We can experience the companionship of the All-in-One together as the One Mind of the Divine Creator. Each day, may we Honor the Day Sign that illustrates a perspective of Divinity. Whatever we choose to do for One, may we do equally for all. We could light a candle in Honor of the Consciousness of the Day that will be shared with us. We could start our ceremony by smudging with sage, and follow with sweetgrass to keep our channel clear of Human expectations. If you don’t have sweetgrass, you could imagine bathing yourself in Light, filling the center within with Divine Light that sustain the purity of our Spirit. May we find our own Sacred way to Honor an Unlimited Opportunity of Creation that the Creator offered to Human with the Promise of Knowing that our Dream will come true. The Monkey/CHUEN trecena Ascends on 13 Night/AKBAL, the Dreamer who Believes in the Dream and holds the Power to Create it. I’m grateful for the One Truth that a Divine Creator loves me more than I can know, and that every experience that is presented to me holds a Design of Divine Justice. Thank you for these daily posts. I follow them daily. 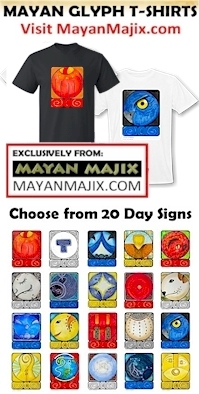 I have been following the Mayan Calendar as a daily practice in this form since 2004. I have been creating art through collage or drawing the glyphs with a running poetry line on and off since then. It is the most consistent daily spiritual practice I have done. I mostly don’t share it as it is personal yet I know I need to start sharing it. I don’t often post here, partly because I’m not used to the format here—tend to be more of a Facebook user—so this feels more awkward to me. I wish you well on your journey to Cancun. I was there recently for an Energy Codes training with Dr Sue Morter and as a side trip we went to an archeological site of where a Mayan Village was. Didn’t make it to the bigger pyramids. Just took in the energy.